As soon as I saw the trailer in Cobb Theatre at Countryside Mall for Zootopia and learned that the guy’s behind both Frozen and Big Hero 6 worked on it, I knew it would be awesome. And, I was right. This movie swept the critics in a way unfortunately Batman V Superman: Dawn of Justice could not. At time of writing, Zootopia’s Rotten Tomatoes’ score beats out the majority of Pixar’s films. And if you’ve seen it then you know why it got such glowing reviews. The animation? Gorgeous. The characters? Lovely. Oh, yes, that message. 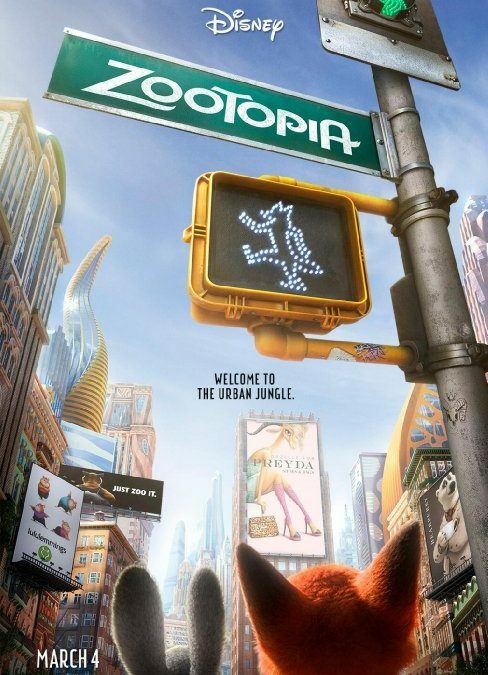 Let’s talk about the message of Zootopia. And how it is a bold choice for Disney to use. Because–besides the, um… “problematic” film, Song of the South–this is the first time I know of where they touched such a live wire of an issue. Now, with that said, it’s not odd for Disney to focus on the “follow your dreams” and “be yourself” messages, and this is really an extension of that…but…it’s also about racism and prejudice. And that’s…a big topic. But they just went for it. I am flabbergasted and mega-impressed by the way they found to teach kids about the evils of racism in a relatively child-approachable and informative way. P.R. wise, that’s incredible for their image. And since, like it or not, Disney is a teacher and a massive part of a lot of American childhoods, they have the ability to make themselves out as a pusher of social reform. I mean, if they can talk about racism–and to a lesser extent drugs–in a way that doesn’t seem pandering, and exposes a societal issue to kids, then what’s stopping them from doing more of the same for war, famine, terrorism, wealth inequality, or religious intolerance? What might this start? What might we see in the future from them? What might happen? How big of a change can come from the story of an animal society?